SRC is required for graduation from Everett ICC and sign up priority will be given to Everett ICC students. This is a seminar-based course, with the goal of facilitating practice and learning of Self-Rescue skills by providing scenarios for the participants to work through. We do NOT mandate a prescriptive method for resolving the scenarios; we prefer that participants execute scenarios in a method that works for them, but we do feature a 'best practices' method in our curriculum for reference. 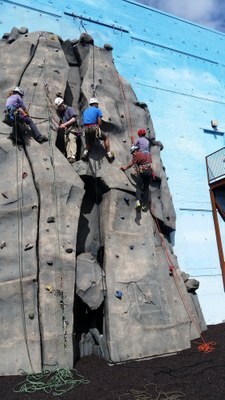 Expectations: This is an advanced level climbing course and it is not intended for novice climbers. The majority of the learning will be putting skills you already have into new sequences to get you and your climbing partner off the hill. A minimum requirement is the ability to lead on rock and build multi-point gear anchors. It will require the ability to improvise as necessary with limited gear. It is assumed that participants will be fluent with the baseline skills of use of the autoblock rappel backup, escaping from a loaded belay and the transition of load to the anchor via the Munter Mule Knot. These skills are introduced in the Everett Branch Basic Climbing Course and taught in the Crag and Intermediate Climbing Course (Everett LOR).